Convert FB2, PDF, DOC and TXT to ePUB. Sync wirelessly across all your devices. ePublr converts all your books or documents into epubs for comfortable reading using iBooks or any other book reader app installed on your device. It not just creates copies of your books in different format, but optimizes layout, text and images. All converted books can be easily uploaded to all your devices running OS X or iOS. You don't even need to plug your iPad to the computer to get all your books on it. Yet, allmost all document can be converted to epub, please note, that ePublr is designed to work with non-scanned documents. ePublr is the best tool to convert fb2 to epub on mac, doc to epub or pdf to epub. All converted books can be exported to iBooks and your favorite book can be synced to iPad. Convert pdf, doc or fb2 to epub in 1 minute: Download ePublr from Mac App Store. Open fb2, doc or pdf and click "Convert to ePub." 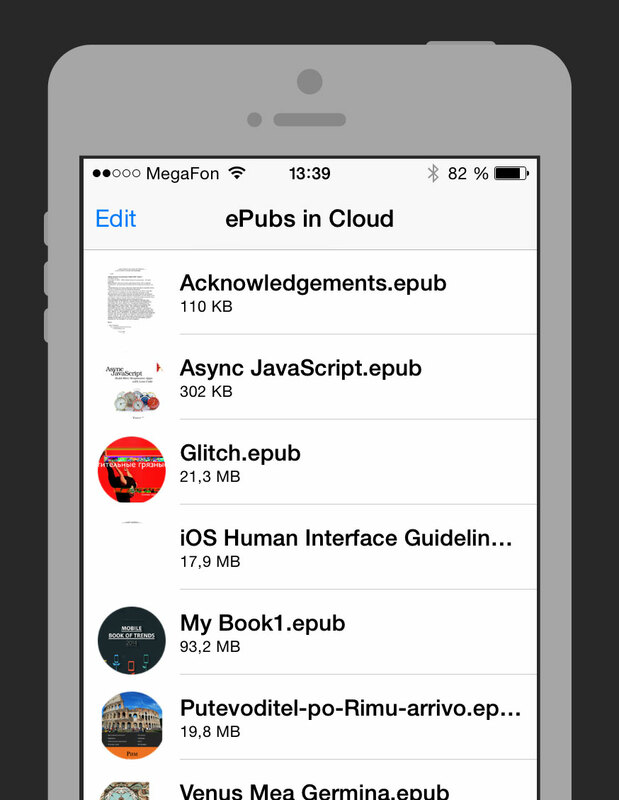 ePublr for iOS enables wireless sync of books between your Mac and iOS devices. It supports both iPhone and iPad. With ePublr for iOS you don't need to connect your iPad to iTunes to transfer new book. All you have to do is enable iCloud. All your books, opened with ePublr for Mac will be automatically uploaded. We are planning to add support for converting fb2 and txt books to epubs directly on your mobile device using ePublr fo iOS in future versions. Stay tuned! Copyright © 2014-2016 Andrey Tsarkov. All rights reserved.